The Kapp Starostin Formation, Festningen section, Spitsbergen. The uppermost of the 3 yellow limestone beds records the Middle Permian mass extinction. This is the first high latitude record of this crisis, which is now seen to be of global extent. The photo, from Isfjorden, Spitsbergen, was taken by Dierk Blomeier. Since the Cambrian Explosion, ecosystems have suffered repeated mass extinctions, with the "Big 5" crises being the most prominent. Twenty years ago, a sixth major extinction was recognized in the Middle Permian (262 million years ago) of China, when paleontologists teased apart losses from the "Great Dying" at the end of the period. Until now, this Capitanian extinction was known only from equatorial settings, and its status as a global crisis was controversial. The widespread loss of carbonates across the Boreal Realm also suggests a role for acidification. The new data cements the Middle Permian crisis's status as a true "mass extinction." Thus the "Big 5" extinctions should now be considered the "Big 6." 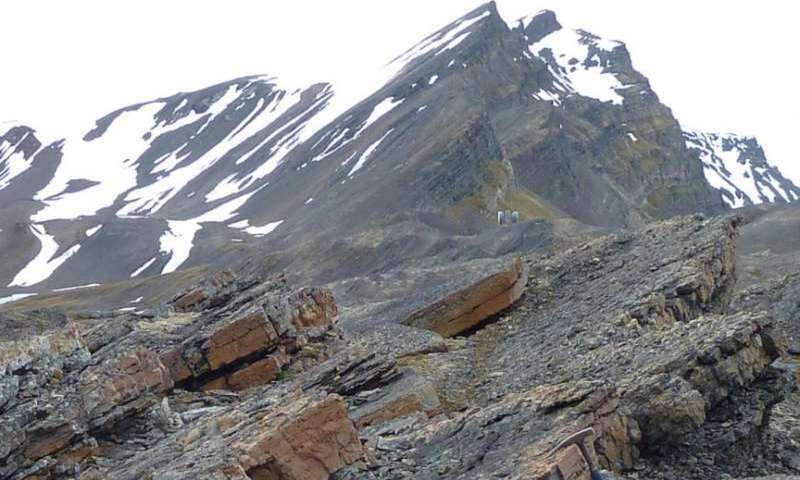 More information: An abrupt extinction in the Middle Permian (Capitanian) of the Boreal Realm (Spitsbergen) and its link to anoxia and acidificationDavid P.G. Bond et al., University of Hull, Hull, UK. Published online ahead of print on 14 Apr. 2015; http://dx.doi.org/10.1130/B31216.1. And we are acidifying the oceans as we sit right now.